I waited. I was surprisingly patient. They sat on the kitchen counter taunting me for what felt like months. 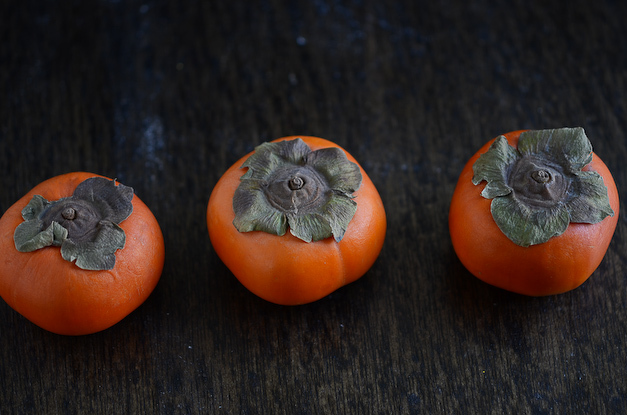 Until finally it was time- the persimmons were ripe. I had all sorts of ideas on what to do with these persimmons when they were ready to my liking, but for whatever reason I landed on doughnuts. I think it's the long nights (Dark at 4:45pm?! How depressing.) that has my body thinking there is a seasonal gluten shortage and my belly needs to stock up for the cold winter months ahead. In reality, I'm just always thinking about doughnuts. 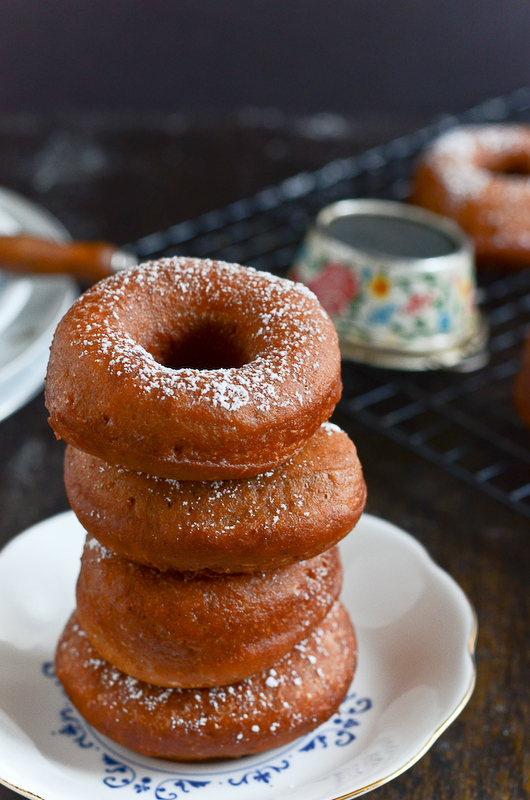 The flavor combination of persimmon & gingerbread made these my favorite doughnut recipe yet! Not only did these taste absolutely delicious, the texture is spot on- light, fluffy, creamy and fried to perfection. Please make these. I care about you and want only the best for you. One more thing before I get to the recipe! Last year I participated in the Great Food Blogger Cookie Swap. Unfortunately I was unable to participate this year, but I can't wait til next year! The swap links amazing food bloggers together to exchange sweet treats while raising money for the charity, Cookies for Kids' Cancer. If you're a food blogger and you're curious about participating in next year's swap, I highly recommend you click the link above and start planning for next year! Not only did I receive cookies in the mail, but I was also lucky enough to form a beautiful foodie-friendship with Erika over at The Pancake Princess. I'm grateful & excited that foodiecrush magazine highlighted the cookies I made for last year's swap in their holiday issue! You can check it out here! In a small bowl, combine flaxseed meal and water; set aside for 5-8 minutes. Beat butter and sugar in the bowl of an electric mixer until light and fluffy. Slowly add the flaxseed mixture, scrapping down the sides of the bowl. Beat in molasses, vanilla, persimmon puree, & spices. Add 2 cups of flour and yeast, beat on low until mixed. Mix in 1/2 cup of non-dairy milk on high for about 1 minute. Slowly add another 2 cups of flour. Beat in remaining non-dairy milk. Add the last 3/4 cup flour. The goal is to have your dough still be moist and slightly sticky. You can add a tablespoon of "milk" if your dough seems too dry or a tablespoon of flour if it seems too sticky. Place dough into a greased bowl, cover and let sit for an hour. Scrape dough onto a well floured surface and gently press the dough down. Roll to about 1/4" thick. 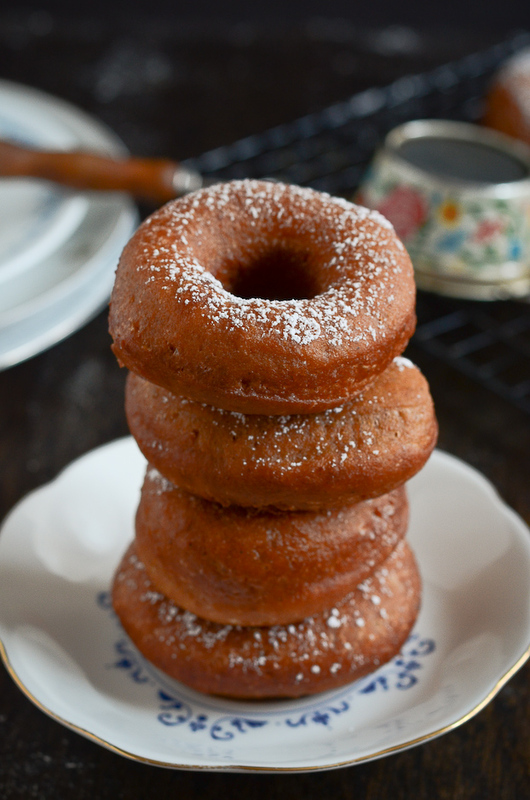 Cut doughnuts, cover and let them sit for about 30 minutes. Heat oil to 350 and fry doughnuts in batches for about 30-40 seconds on each side. You want a nice golden outside.